COUNTER ACT written, directed and produced by The Affolter Brothers, Nathan Affolter, Jon Affolter, Heath Affolter and Thomas Affolter, executive produced by Paul Armstrong, Robin Chan, Ed Brando, Robert G. Heimbecker, Chris Phillips & Marc Stephenson, DOP Stefan Berrill, starring Teal Fiddler, Naika Touissant, J. Alex Brinson (The Prince), Louis Ferreira (Motive), Chelah Horsdal, Cameron Bright (Twilight), Dakota Daulby (Black Fly), Stacie Mason, Genevieve Buechner & Jacqueline Robbins (A Series of Unfortunate Events) – When Alice, a naive young woman having lunch in a diner circa 1960, joins Mary and Ray in their “sit-in” protest, the ire of the racist patrons boils over and Alice learns what it truly takes to stand up for what you believe in. GANJY written and directed by Ben Ratner (Moving Malcolm), produced by Tony Pantages and Ben Ratner, Executive Producer Aleks Paunovic, DOP Pieter Stathis, Music by Jesse Zubot and Chris Ainscough, Starring Ben Ratner (Wonder), Aleks Paunovic (Van Helsing), Zak Santiago (Dirk Gently’s Holistic Detective Agency, Iteration 1), Donny Lucas (Wayward Pines, Aardvark), 14 min, 2016 – Contending with dementia pugilistica, a reclusive former boxer is on the ropes until he’s visited by three old friends. AWARDS: Premiered at Vancouver International Film Festival 2016 – acquired for international distribution by Network Ireland Television, UK. THE REMEMBERER directed by Coreen Mayrs (casting director), starring Ben Ratner (Moving Malcolm), Stephanie Morgenstern (Flashpoint), 10 min, Crazy8s 1999 – A man’s mysterious devolution leaves his lover to decide his fate. GROCERY STORE ACTION MOVIE directed by Matthew Campbell, written by and starring Peter Carlone and Chris Wilson, produced by Jameson Parker, David Kaye and Ryan Silva, Crazy8s 2016 – Alex is in the express checkout lane at the grocery store when he realizes with horror that he has forgotten the all-important crackers. With his dinner guests already on their way over, Alex must risk life and limb to achieve the impossible: locate the salty snacks before losing his place next in line. A send-up of action movie clichés created by and starring three-time Canadian Comedy Award-winning sketch duo Peter n’ Chris. TRAILER for MENORCA directed by John Barnard (The Sheepdogs Have At It), written by John Barnard; produced by John Barnard, Kyle Bornais, Chris Charney, Scott Leary and Michael O’Sullivan; DOP Markus Henkel; music by Mitch Dorge; starring Tammy Gillis (The Arrangement, Supernatural), Sheila Campbell (The Editor, The Pinkertons). 81 min., drama, 2016 – Synopsis – A hedonistic soccer mom embarks on a strange journey of self discovery. World Premiere at Whistler Film Festival 2016, Screenings at Noida International Film Festival-17 – Delhi India and Cinequest International Film Festival 2017. 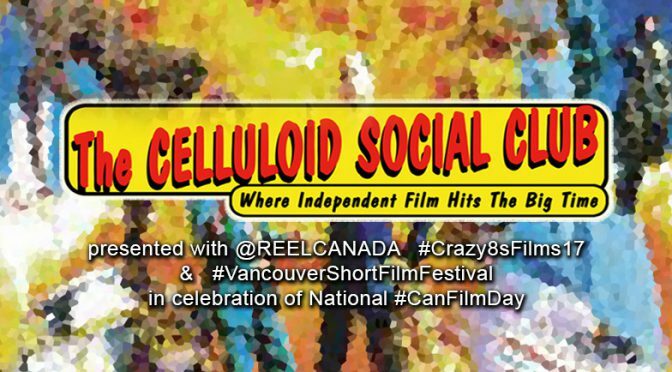 Screening in Vancouver on April 15, 2017 at the Vancity Theatre. Screening in Winnipeg from April 20-30 at the Winnipeg Cinematheque. Screening in Toronto from April 21-27 at Imagine Cinemas Carlton. Winner – Best Actress for Tammy Gillis at the Noida International Film Festival-17. Winner of four Windy Awards 2017 – Best Feature Film, Best Cinematography, Best Sound and Best Production Design.